Some days ago I was dealing with an Android malware, it hides strings and other things inside an arsc file. The resource item is identified by an hex value. The value contains three informations: Package id, Type id and	Entry index. The problem is: can I easily recognize the resource item during a static analysis of the malware? As promised, I’m writing a new post about Koler. This time I’ll talk about the communication between the mobile phone and the external domain because the malware makes use of a minimal C&C feature. There are mainly two classes that are responsible of the interaction: com.android.6589y459gj4058rtgc.6589y459gj4058rtga and com.android.6589y459gj4058rtgd.6589y459gj4058rtgb. The flow of the program is guided by many conditional checks over some boolean flags. The flags are used to store the status of things like screen_is_off/screen_is_on/activity_is_stopped/etc.. I won’t put all these conditional checks in the analysis, because I want to write something as clean as possible focusing my attention to the client-server communication only; moreover it’s a detail you may easily check by yourself. Everything starts from the run method of a thread (look inside com.android.6589y459gj4058rtgc.6589y459gj4058rtga), the client contacts the server passing a parameter to it. The parameter is an URI containing a string in this format: “random_string=mobile_phone_imei”. The random string len is 0x0A chars. It returns null or a response string from the server. This is a standard piece of code used to get the reply from the server. Unfortunately I can’t dynamically check the response string because -fortunately- the domains are not working anymore. Luckily the run method contains a call to a method used to check the returned string. Let’s see if I can reconstruct the format of the response string. The execution of this method represents the end of the thread’s run, and since of this called method doesn’t return anything it’s likely to assume that something important could be inside it. The parameter is the response from the server. Here’s the first information about the response string, it can be empty. From my previous article about Koler I know that FIND_VALID_DOMAIN is used to load one of the hardcoded domain page on the mobile phone browser. The page contains the ransom advice. String s = jSon.getString(6589y459gj4058rtgc);   // 6589y459gj4058rtgc = "sign"
Another base64 encoded string, if the sign string is null the returned com.android.6589y459gj4058rtgd.6589y459gj4058rtga values is UNKNOWN. String str = new java.lang.String(jSon.getString(6589y459gj4058rtgb);   // 6589y459gj4058rtgb = "data"
Here’s the final check over the UNKNOWN/UNLOCK value obtained from the response string. I already said what UNKNOWN means, it’s time to see what happens when UNLOCK tag has been received. First of all there’s a check over the Json time field value passed from the server, if the current day is equal to the one specified by the server I got false into v0 and SET_UNLOCK–UNINSTALL messages are sent to the message handler. The day-check is done comparing the current day, month and year. SetUnlock lays the foundation and Uninstall provides to uninstall the package. To sum-up, as far as I’ve seen UNKNOWN and UNLOCK are the only two commands from Koler’s C&C feature. The first one is used to show the ransom advice located on a domain web page. The other one –UNLOCK– *should* remove the malware from the system. I can’t be 100% sure because I’m doing a static analysis and I can’t test a real response from the server. While I’m reversing a malware I usually use pen and paper to write down findings, no matter what’s the importance of any single clue. Sometimes it’s only a particular address or a handle, but for complex malware I like to draw a scheme with all the entities because it’s particularly useful when I have to put together all the small pieces to complete the final puzzle. I’ve seen malwares that are much more complicated than Koler, but the use of obfuscated names (Proguard is most probably used) increased the time I spent to understand everything . These are nice readings for sure because I like to be informed on every possible new threats, but I also would like to learn something new in terms of technical knowledge. My impression is that all of these articles are pretty similar, and they all seem to be born from what I know to be the first real article about the subject written by @kafeine. I’m not asking for a complete analysis (it could require a lot of time and too many pages to write down), a detailed part on a specific argument or a personal comment about specific parts could be enough. Since of there are a lot of Android components involved in the general scheme of this malware I decided to write a description of the methodology I used to statically studied the malware. It’s an easy level tutorial, but I hope to give you some hints on how to approach an Android malware directly working on components/entities like activities, services, receivers, message handlers, etc. Few lines to specify the activity to launch: com.android.MainActivity is the starting point of the entire package. The manifest file is always the first thing you should put your hands on, it generally shows you the path to follow. The activity contains a lot of methods, where do I have to start from? I normally start checking the init method because it does reveal the initial value of main variables. This is the very first method I use to check on a new class file to study. Besides that, there are an unspecified number of various methods, and some of them are callback methods called by the system when the activity switches from one state to another. These are really important, you have to take the activity life-cycle in your mind in order to better understand the complete behavior of the activity. 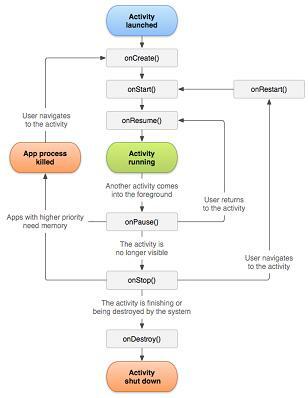 MainActivity defines onCreate only, it’s called when the system is creating the activity. Besides the layout initialization (which is a must and it’s defined calling SetContentView function) a coder can do whatever he wants inside the method. This time OnCreate is the only defined callback. The reason is simple because the only job of the activity is to start a new activity named LockActivity, the real starting point of the malware. This new activity is by far different from MainActivity because it has a complete life cycle definition. Among all the methods you will find most of the callbacks that are on the activity scheme: onCreate, onStart, onResume, onPause, onStop and onDestroy. The first three methods are executed in sequence, here’s a brief explanation of them. It’s easy to get the buildID: C143D55D996634D1B761709372042474. The last performed action inside the current method is to bind the service com.android.LockService. The bind operation is used to start a service, I’ll tell you later all the details about this operation. onStart: it simply sets a flag. I call it StopFlag because the value is false when the activity starts and true on onStop. There are some other class defined as interface, now within few seconds you should be able to locate the real code of every empty class. After onResume callback the activity is in a running status, and the flow depends on the behaviour of other entities like service, thread, human-operation, etc. I can’t say too much about the other common callbacks: onPause, onStop, onDestroy. There are a lot of conditional checks over boolean variables because the author uses them to store the status of things like stop/run, pause/run and so on. I’m sure you won’t have problems trying to understand the code, just pay attention to the obfuscated names and you’ll surely understand everything about this class. It extends android.os.Handler. Moreover there are few methods only inside the class and all of them are called by a method called handleMessage, the name of the public method you have to subclass in case you want to receive messages. A custom message handler class doesn’t have a life cycle like an activity or a service, you don’t have a specific entry point. I sugget to start the analysis from the subclassed methods, in this case handleMessage because it’s the only one. Here is a brief analysis of handleMessage (in order to keep the code clean and readable I removed useless instructions/keywords from it). instance_of(p1.obj, com.android.6589y459gj4058rtgs) ? v0=true : v0=false; // Is it a valid message? UNINSTALL message has been received, it handles it by calling 6589y459gj4058rtgb. You’ll see this piece of code some more times inside handleMessage because there’s a check for every single type of possible received messages. The list of the available messages is composed by: UNINSTALL, CHECK_FOR_UNLOCK, SET_UNLOCK and FIND_VALID_DOMAIN. The most interesting message is the last one because it’s called when the malware needs to load one of the hardcoded URL located inside arrays.xml file (it’s under res folder and it contains a complete list of available URLs). The class defines his own method and it implements some more methods. It also implements Runnable so, after init, I would check run method because it’s called when the thread is started. There’s a data exchange between the external domain and the mobile phone. The malware provides to pass the IMEI (and the buildID) to the domain, and the domain sends back something else which is base64 encoded. As far as I’ve seen this is the only place from where crypto related functions are used. I will reveal the details about this part in a future blog post. Just in case you can mail me for some more details. However in the last part of the run method, after a series of calls to various methods, the web page containing the notice about the locked device is loaded on the infected mobile phone (via sendMessage(FIND_VALID_DOMAIN)). flag: BIND_AUTO_CREATE stands for automatic creation of the service. According to Android web page a service is defined as an application component that can perform long running operations in the background and does not provide a user interface. A bound service runs only as long as another application component is bound to it. The image respect the fact that the service stays in background until unbindService is called. The scheme is very important for me, because it reveals the pah to follow for an almost complete analysis of the service. You have to study, in order: onCreate, onBind and finally onUnbind and onDestroy. onCreate: this method is responsible of the creation of a system used to catch specific actions and broadcast particular intents. It sounds confusing right now, but everything will be clear in the next section. OnBind: nothing really special, it returns an Ibinder reference. OnUnbind/onDestroy: the client is not bound to the service anymore. The receiver is registered with registerReceiver method. It takes two parameters, the BroadcastReceiver and the intents broadcast to be received. The receiver is defined inside com.android.ScreenOnOffReceiver file and it has the only necessary method, onReceive. It handles the broadcasted intents checking for “android.intent.action.SCREEN_ON” or “android.intent.action.SCREEN_OFF” action. As you can see from the snippet the intent filter is associated with a prority number which is used to check, among all the applications, who can send broadcasts. Another similar piece of code is then used to define a new alarm every 10 minutes, this time the receiver is inside com.android.ScheduleUnLockReceiver but the essence doesn’t change. 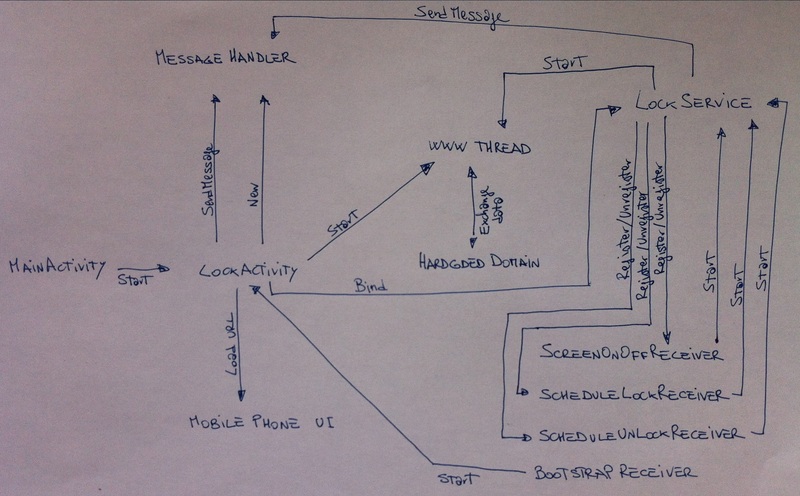 onReceive is inside com.android.BootstrapReceiver and the intent is received after the system has complete the booting operations. To be sure the malware will run after a boot the receiver will start the core of the entire malware, LockActivity. Once again, AndroidManifest.xml represents the first thing to take care of when you are studying an Android based malware. Service once again? Yes, there’s something more to say about it. Is it possible to start a service in two distinct ways? Yes it is. There is a big difference with a bound service because now the service runs in the background indefinitely, no matter wether the component that started the service it’s destroyed. The second line of the snippet contains a call to putExtra method, it’s a way to pass extended data to a service. Take a close look at ScreenOnOffReceiver, ScheduleLockReceiver and SheduleUnlockReceiver, you’ll notice that they all run the service using the same piece of code with just a little exception: the value passed via putExtra is 1, 2 or 3. It’s definitely a not-complete tutorial, I just tried to give you the most important informations explaining how to deal with components and other Android entities. Consider it as a story on how I studied the malware. Feel free to mail me for comments/criticism/whatever you want. Thanks to @Gunther_AR for some precious suggestions!